Apple fans argue Snow Leopard Server is functionally equivalent to Windows Server running Microsoft Exchange, Office Communications Server, SQL Server, SharePoint and a third party anti-spam engine, but that Snow Leopard Server costs much less than Windows. And with OS X there are no additional per-user license fees to pay for each of these apps. Hardware costs for running Snow Leopard Server could also be much lower than a Windows equivalent. For example, Windows Small Business Edition requires some kind of server hardware, and Microsoft Windows Essentials Business Server needs three separate hardware platforms. By contrast, Snow Leopard runs on any Apple Mac hardware, ranging from low cost Mac Minis up to datacenter grade Apple Server kit. At its core, OS X is a Unix operating system configured with various open-source applications. Consequently a skilled server administrator could achieve similar results using a free Linux distribution. However, the amount of time and effort needed to build a Linux server with the same set of applications makes Snow Leopard a compelling alternative. In our Lab tests we found installation of the full Snow Leopard suite was very quick and simple. It took us about one minute to configure the various options, and about 30 minutes for the software to install – we booted with the Snow Leopard DVD, answered a few questions and left it to complete the installation process. After this our Snow Leopard Server had been automatically configured with things like self-signed SSL certificates – a process that requires extra work in alternative server environments. Of course, a little further setup was needed to configure some of the server applications, such as the Bind DNS and Mail 2 email servers, but where possible the server apps were working properly without any extra input from us. For example, the Wiki engine was up and running as soon as we booted our new server. We pointed a Microsoft Internet Explorer web browser at our server’s IP address and were greeted by a neat and stylish front page, complete with a login button and buttons to access the Wiki. Once we logged in we could navigate to our private Wiki pages and web based views of our iCal calendar. The web versions of these tools presents superb, polished and feature rich user interfaces for users that don’t have access to a Mac desktop, which could include people using Windows desktops and mobile devices. As we said earlier, the applications that are bundled with Snow Leopard generally come from major open-source projects, and in many cases these are best of breed tools such as the Apache web server and Bind DNS server. But in the case of webmail, Snow Leopard uses SquirrelMail. 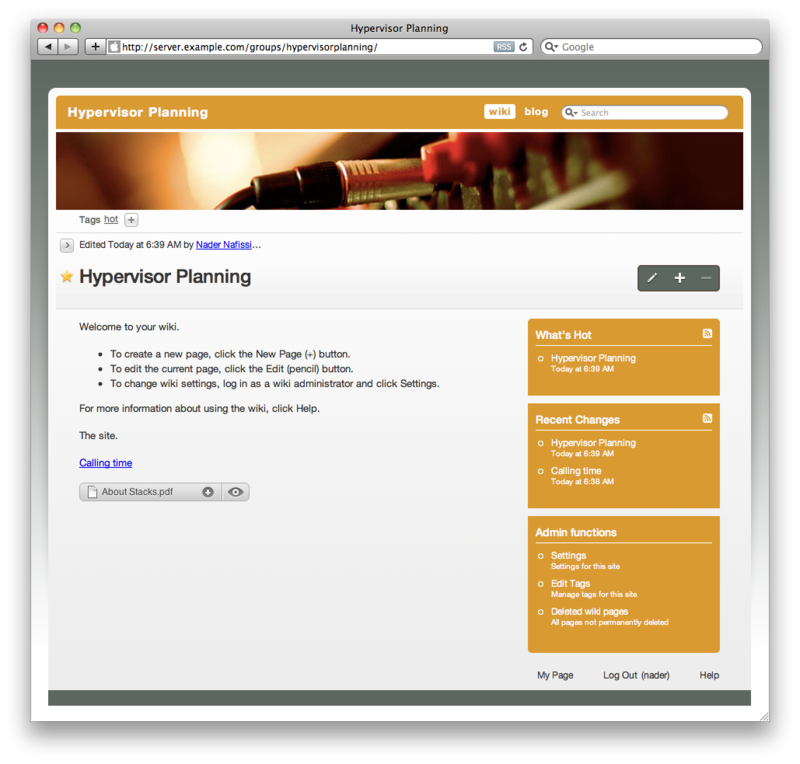 While this is stable and simple to use, it looks old and clunky alongside the Wiki and web based iCal tools. Let’s hope it will not be long before Apple releases an update that replaces SquirrelMail. This article was published on Tuesday, January 5th, 2010 at 4:00 pm. You can follow any responses to this article through the RSS 2.0 feed.